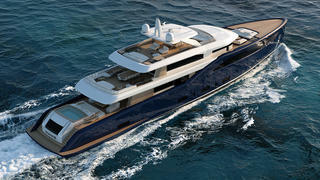 Italian studio Nauta Design has styled its first motor yacht for Pichiotti, the 50 metre PY50 concept. The new design features modern-classic exteriors, all-aluminium construction and a total interior volume of less than 500GT. Nauta Design drew on its strong experience in styling sailing yachts to create a motor yacht that makes the best possible use of all available spaces, including numerous areas where the interior flows seamlessly into the exterior. Key features on this tri-deck motor yacht include a large bathing platform for easy access to the sea. 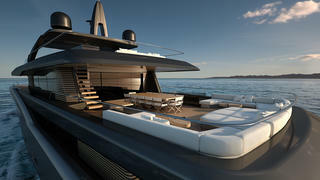 From there, twin staircases lead up to aft-deck superyacht spa pool and adjacent sunbathing area. A sheltered C-shaped wrap of seating provides further relaxation options. On the upper deck there is enough room for 12 to enjoy an al fresco meal around a large dining table, while the superyacht sundeck includes a central table surrounded by nine freestanding chairs and further sunloungers and sunpads. 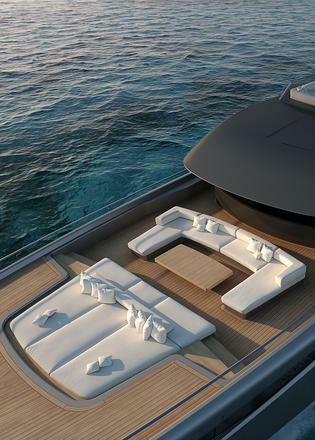 The walk-through foredeck seating area completes the array of exterior lounging spaces on board the Pichiotti PY50. Further details are being kept under wraps for now, but the initial renderings show a hatch cut into the blue topsides, hinting at a side-loading tender garage. 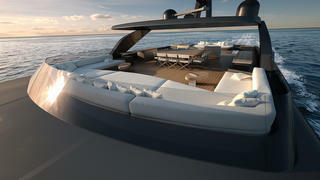 The PY50 is the second superyacht concept that Nauta Design has revealed in recent weeks, following hot on the heels of the 102 metre Oceanco Project Spectrum.